Just a few days ago, I saw a post over at Mel's Kitchen Cafe for something that I had to make...chocolate peanut butter brownies! You might look at the brownies and wonder, "where's the peanut butter? ", since there's no indication of it, no swirls to look at. Like Nutella brownies, the peanut butter has been incorporated into the batter and while you do not see it, you will taste it. There were a couple of reasons why this recipe called out to me. Firstly, I always welcome an excuse to bake a batch of brownies! Who's with me on that? Secondly, I'm on the lookout for simple, fun, tasty things to bake with my son. He had a break in summer camps this past week and when I saw the brownie post, I thought it would be a great thing for us to whip up together. So once again, my little helper and I present another baking experiment from our summer kitchen! We're really happy we made these chocolate-peanut butter brownies. 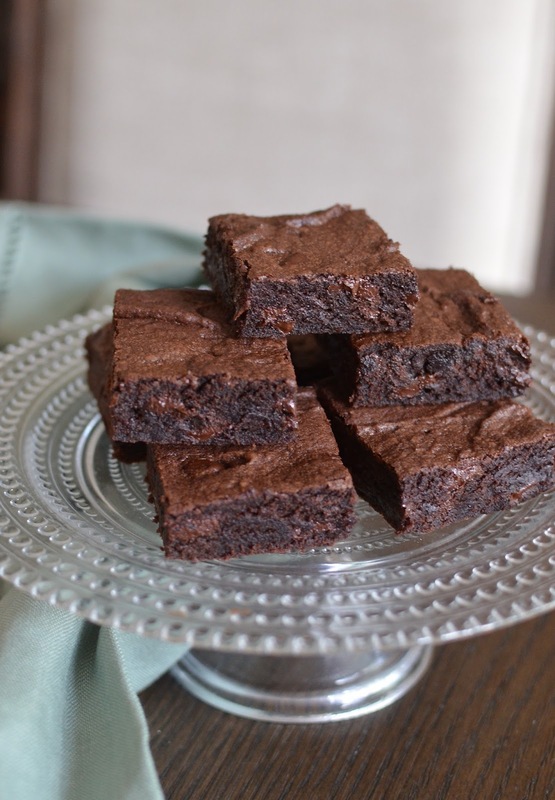 They are incredibly moist and fudgy in texture, yet surprisingly light at the same time. You smell the heady aroma of the peanut butter and taste the creaminess and flavor it adds to the brownies. They are a wonderful treat for those who love chocolate and peanut butter. As someone who craves peanut butter a lot, they hit the spot for me and frankly, it was hard to stop eating them. My son thought these would turn out to be like peanut butter cups (i.e., very good) and they didn't disappoint. So not only did I get to have another fun baking session with my young fella but we got a great brownie recipe we'll surely be making and enjoying again in the bargain. I think this (and brownies, in general) is a great thing to make with kids. It's easy and you end up with a batch of brownies at the end of your efforts! That has to be a surefire winner. Though I try to look for recipes that don't use the stand mixer when I'm baking with my little guy so he gets more hands-on time, there was plenty to mix and stir up. Plus, he found it interesting to "work" the stand mixer and see how it functioned on different speeds and such. Funny enough, my little/big guy sweetly thanked me the other day for baking with him. He explained to me how he used to "hate it" when I dragged him into the kitchen but now he loves it. Ha! We've come a long way, it seems. And when I said maybe we should make something savory next, he tells me it's okay because he's really into "bacon...and baking, lately." Don't you adore 11-year old boy humor (and honesty)! But back to these brownies, the batter you end up with - one mixed with creamy peanut butter, butter, sugar, and cocoa powder, along with a cup of chocolate cups (in my half recipe) - will be a thick one. Spread it around evenly with an offset spatula and bake in a 350 degree oven. I felt it was imperative that I watch the brownies to make sure they don't over-bake. You know how it goes with brownies. Over-baking is always my number-one concern and when it's a batch of brownies I'm making with my son, the stakes are high (I really want them to turn out well!) so I watched it like a hawk near the end. When all's said and done, the brownies took about 20-21 minutes, a bit longer than I would've thought. You want a cake tester/toothpick inserted into the brownie to come out with some moist crumbs; it shouldn't be dry but it shouldn't be very wet either. Everything turned out well! Once cooled, I sliced up our brownies into small squares. We love how moist and fudgy they are - like a super moist chocolate peanut butter cake that's actually quite light in texture. I'm craving one as I write about it right now! Preheat oven to 350 degrees. Lightly grease an 8-inch square baking pan and line it with a piece of parchment, with about a 2-inch overhang on two sides. In the bowl of a stand mixer (or electric hand mixer), cream butter and peanut butter together until smooth and creamy, about a minute or so. Add sugar and beat until incorporated, scraping the bowl as needed. Add eggs and vanilla, mixing until combined. Add cocoa powder and stir together until no dry streaks of cocoa remain. In a bowl, whisk together the flour, salt, and baking powder. Add dry ingredients to the batter and give it just a stir or two. Add chocolate chips and then stir all together until combined, with no dry streaks in the batter. Spread the thick batter evenly into the prepared baking pan. Bake until a toothpick inserted into the brownie comes out with some moist crumbs attached, about 20-24 minutes; do not overbake! Let brownies cool in the pan, then lift them out using the parchment overhang and slice into squares. You have a sweet and very competent sous chef in your kitchen. The combination of peanut butter and chocolate is just unbeatable. I love how moist these brownies look - just like cake! Choc + PB is a favorite so can't wait to eat these up! I can't get over how moist your brownies look -- my favorite brownie texture ( I just hate the dry brownies). Fantastic recipe that I'm happy that you shared Monica! It's so satisfying, taste-wise, with the peanut butter in the background, too. Thank you! What a lovely combination dear. Looks so moist and delicious. I want to have at least 5 of them right now :-) Have a great weekend! Agreed! 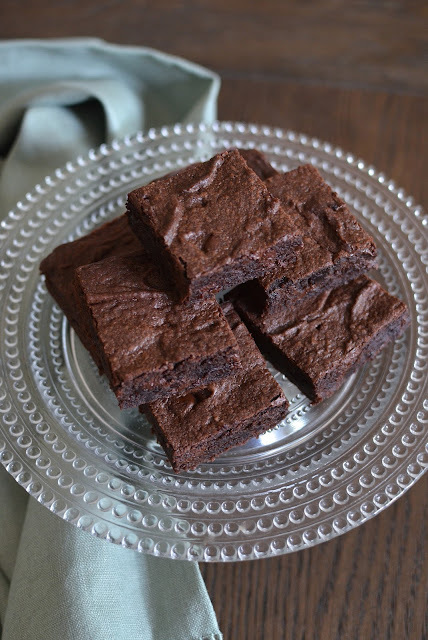 I too am always in the mood to bake up a batch of brownies; in fact, I was just thinking the other day that it’s been a while since I’ve last made brownies so here’s the perfect opportunity! And the addition of peanut butter is brilliant! Thanks for the idea, Monica (: And +1 on the cold brownie straight from the freezer/fridge. That’s my favorite way of eating them. Yes, these are great! I like brownies every which way but I think they're fudgier out of the fridge...always a good thing in my book! Hope you get some more time to cook and bake this summer! Your son sounds like a real charmer! He is so cute too. These are memories he will always have in his heart - just like I remember that my mom and her mom took the time to show me how to bake. Very special times! And these brownies look very special too! YUM! Have a lovely weekend Monica. Ha - you are kind, Tricia. He's got a little sense of humor, that's for sure! Very kind of you to say, Cheri! Appreciate it!! Peanut butter and chocolate are a surefire winner! These brownies sound great. I used to love baking with my girls when they were small - and every once in a while when they're home, we still do! These were so very tasty...we're very happy we experimented and gave it a try! And your daughters seem like such lovely young ladies. I can totally imagine you all cooking together! One of my favourite bakes! What a delicious combination, you can't go wrong. Only thing that can make brownies better is peanut butter!! Love it! They're so good...I think you would enjoy these, Ashley. What a lovely young man and so talented too. The brownies look amazing! How nice of you...thanks so much! Such a sweet post! It's certainly great to have company in the kitchen and your little man is quite the baker! The brownies look amazing. I have to try this combo as I've never had a peanut butter-chocolate brownie. I'm pretty sure though that I'll love it! He's become so much more competent and I can turn around now without worrying that he's gone and dumped the sugar all into the bowl or cracked the eggs into the floor. haha! Oh! So cute your little helper...and yes, these brownies look so moist and fudgy...almost creamy! Love the combination of peanut butter and chocolate! It really is a bit creamy and I really savored that peanut butter texture and flavor. The helper and I had fun. Hope you're having a fabulous summer so far, Juliana! Your little chef is so cute and I love the combo of chocolate and peanut butter! Ohhh I'm always looking for a reason to bake brownies too! Thank you for giving me a new one! Ha! These look so delicious. Right! Who wouldn't want another reason to bust out a pan of brownies. ; ) Thanks for stopping by, Erika. Take care and enjoy the rest of the summer. Chocolate and peanut butter were made for each other! Your assistant chef did an excellent job with these brownies. :) I had a feeling he would grow into enjoying creating with you in the kitchen!